Lauren Birmingham Piscitelli is the Creator & Owner of Cooking Vacations Italy. Lauren is an artist at heart. She created Cooking Vacations Italy and continues to bring new cooking experiences as she travels across Italy, always meeting chefs, wine makers and food experts. Lauren began her career in the communications as a writer and photographing for The Brown Daily Herald at Brown University. She graduated, moved to Paris and joined the marketing & publicity department at Hasbro Toys, Paris, France. She returned to Boston and created Birmingham Public Relations where she managed media campaigns for Red Sox, Celtic, Patriot & Bruins sports stars, Chefs, Rebook Sports, and the Boston Marathon. A published writer & photographer, and foodie at heart, she loves to cook! Traveling, discovering new food recipes & trends is a never-ending adventure. 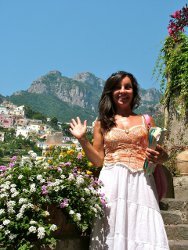 Born in the USA, she is an Italian-American who now lives in Positano, Italy.